They both look exactly same but are quite different in taste especially the Moong dal pakodas. They are much better than the Besan ones in taste and texture. Soak Dal in water for 4 hrs. After 4 hrs, separate Dal from water. Grind the Dal to make a fine & smooth paste. After grinding, keep 2 tsp of Dal paste aside and use rest of the Dal paste for making Pakodi. To make Pakoda: Add 1/4 Tsp Red Chili Powder, 1/4 Tsp Salt, 1/4 Tsp Coriander Powder and 1 pinch Baking Powder. Keep on mixing it for 2 minutes. This will help to make soft Pakodi. Heat Oil on high flame. Pick a small quantity of the mixture to make a pakodi and add gradually to the hot Oil for deep frying. Fry on high flame until they become golden brown in color. When they achieve light golden color from the bottom, flip them so that they achieve same golden color on all the sides. Once they attain golden color, switch off the stove and take them out of the Oil. Keep them aside on paper towel for later use. In the paste of 2 tsp Moong dal which we kept aside in the beginning, add Red Chili Powder, Salt and Coriander Powder with 1 cup of Water. Grind this mixture to make a smooth paste. Once done, keep it aside for later use. Add Oil to the pan and heat it on high flame. In hot Oil, add Asafoetida and Red Mustard Seeds. Roast them for 20 seconds. Once Red Mustard seeds are roasted, add Curry Leaves, Dry Red Chilies and Turmeric Powder. Now add Dal mixture along with 3 cups of water. Mix well. Keep the stove on high flame and bring it to a boil. After a boil, turn the stove on low flame and let it cook for 30 minutes. After 30 minutes, Kadi is ready. Do not forget to stir it occasionally in 3 min. time frame of cooking to avoid burns. Now add Pakodi and cook for another 5 minutes on low flame. After 5 minutes, switch off the stove. Moong Dal Kadi is Ready. Before serving, we need to make a spicy Tadka. Which will enhance the taste of the Kadi. Lets learn how we can make that in just 2 minutes. Now add 1/4 Tsp or to taste Red Chili Powder. Just after roasting the red chili powder, add it to the prepared Kadi. 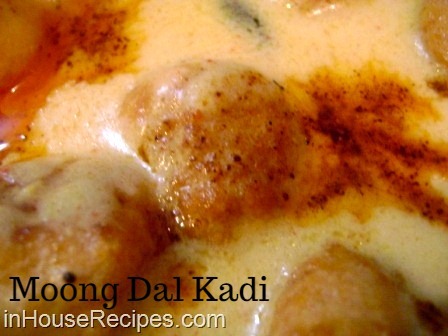 The delicious Kadi is ready to serve hot. I hope you will try and like this recipe. 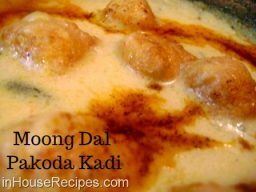 You can also check out the conventional besan based Kadi Pakoda or another unconventional kadi called Imli Aloo Kadi.I hope you will like this recipe and share your comments too. Enjoy.